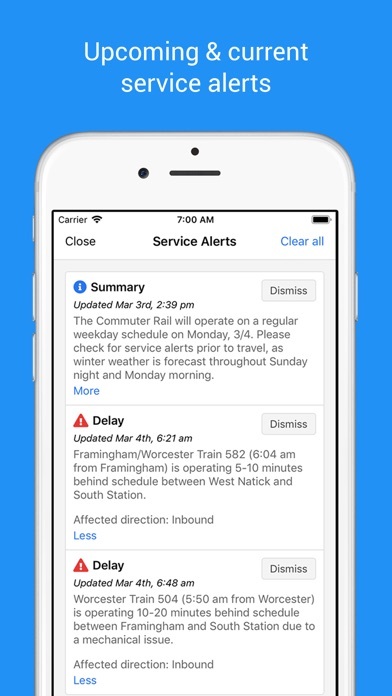 MBTA Rail provides experienced Boston commuters with as much information as possible about the location and status of their trains. 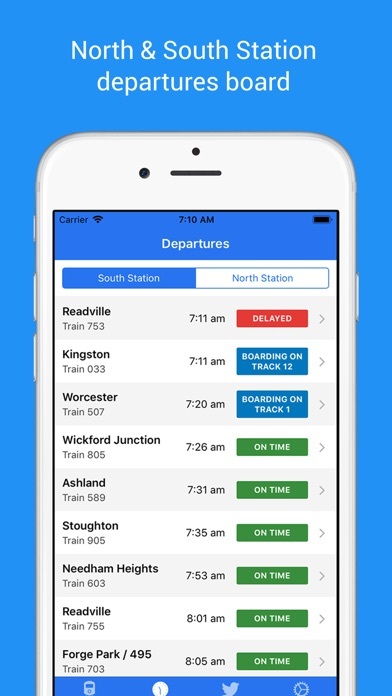 This app is designed for seasoned commuters who are already familiar with their line schedule. 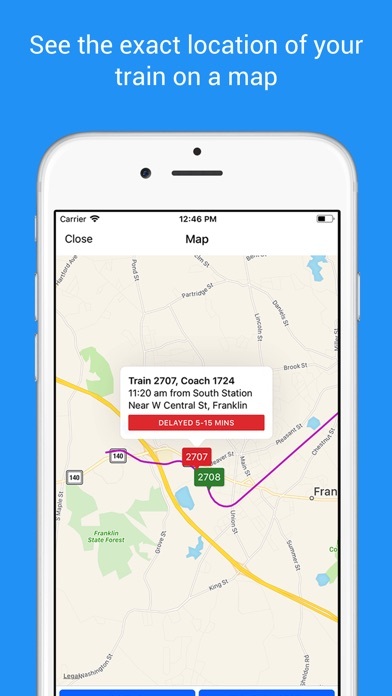 Features include: • Near real-time location information (next stop, current stop, GPS location, predicted arrival time, and vehicle speed) • Boarding track numbers • See your train on a map along with other trains along your route • View historical coach numbers, boarding tracks, and average on time percentages • Crowd-sourced information. Is a prediction wrong? Train delayed mid-trip? Wondering if your train is standing room only? 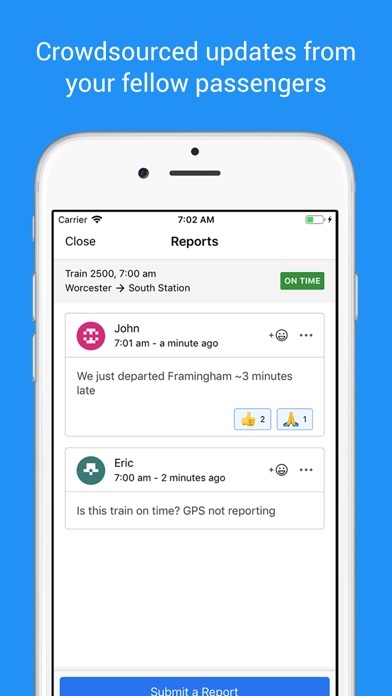 Discuss through the "Reports" button next to each trip • Full schedule view with predicted arrival times for each stop • Service alerts (delays, cancellations, track changes, etc.) 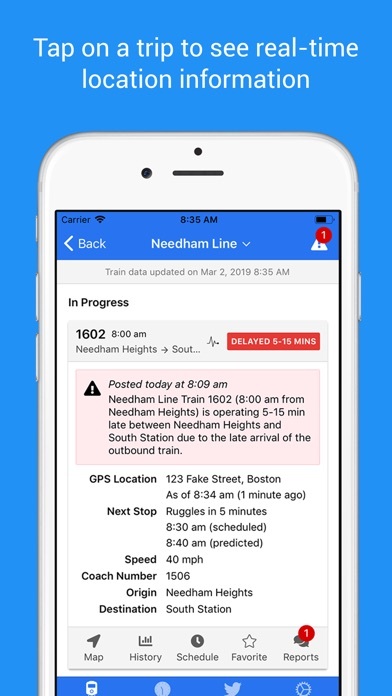 • Clean, user-friendly, and ad-free interface Note: data is sourced directly from the MBTA's real-time feeds which is collected using PTIS equipment installed on the trains. 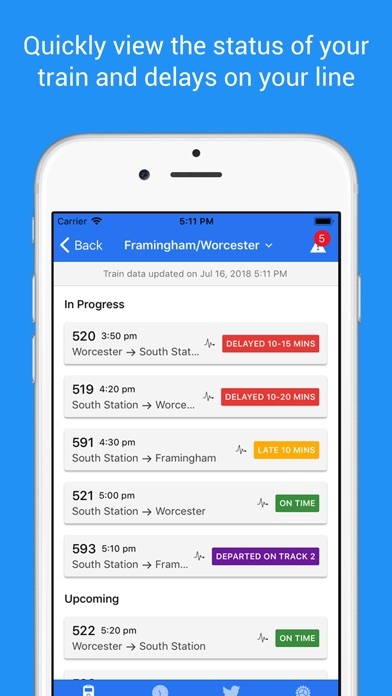 We don't make any predictions ourselves; this app is simply an interface for the MBTA's data. 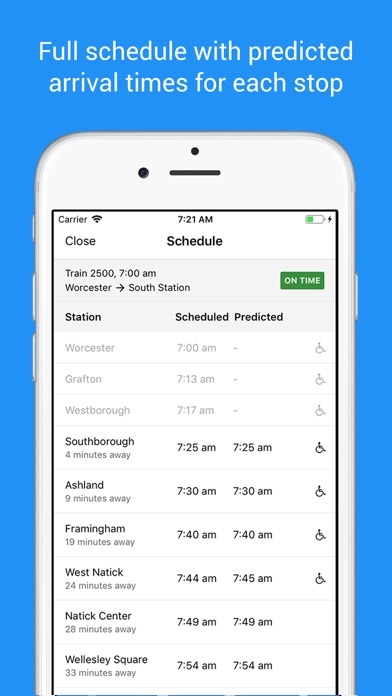 This app is as accurate as the MBTA's data allows us to be. We are NOT affiliated with the MBTA, Keolis, or MassDOT. Follow us on Twitter at @MBTARailTracker for updates. Great app for the regular commuter. Smooth and straightforward. Just remember the reports are crowd generated and the data is from MBTA! If you commute in to Boston daily this app is for you. It can help you get a jump on the crowds boarding the trains at south station and confirms if your guess was correct after you’re on the train. Really well done. Community comments can get a little annoying but they are still more useful than not. Would be cool if you could implement a reddit comment rating system so the gold would flow to the top and the nonsense would drift down into obscurity, a feeling commuters can appreciate. The Franklin Line comment section alone is worth the price of admission. The train isn’t marked late until it’s already supposed to be picking you up! I’m standing ankle deep in a pile of snow waiting for a train that’s 30 minutes behind schedule! If the train is going to be late they know it well before the pick up time arrives. Let people know so they can plan accordingly. This is a most helpful app. Function is top notch and is reliable Understanding the data comes from the MBTA the app does a great job of presenting it! This app is the perfect combination of schedule data and crowdsourced comments. If you want to know exactly what’s causing a delay, up to the minute, this is it. Also great for knowing what track a train is departing from way before it’s announced. But shh, don’t tell TOO many people! My wife and I Love this app! It provides the most accurate and up-to-date information in a format that easy to read and understand. We have other apps, but this is our primary! Keep up the good work! Stop taking trains off the board that are not even close to Boston.